Funko SuperCute: The Real Cthulhu | Nerd Much? Cute isn't exactly what H.P. Lovecraft had in mind. Joining Funko’s SuperCute line is The Real Cthulhu. It measures at 12 inches, quite tall for something so detailed. Big enough to be comfortably cuddled and small enough to be put on a shelf for safe-keeping. 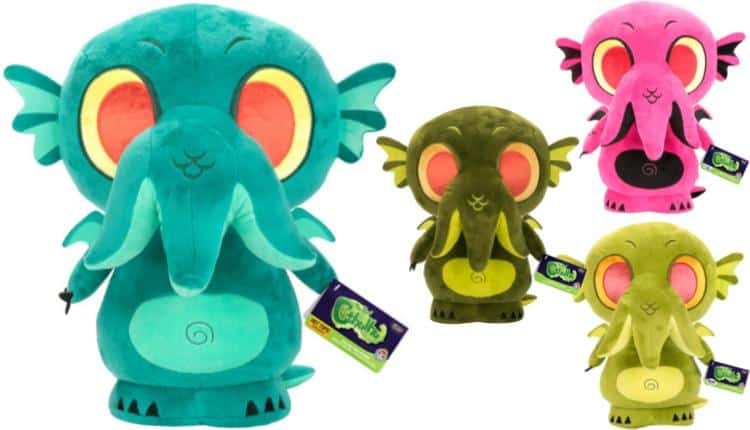 The Real Cthulhu comes in four different colors, dark green, light green, pink, and turquoise. The dark green model is available now at any participating retailers, including Wal’Mart, Target, Gamestop, Fye, Best Buy, and plenty more. The other colors will be available in January and each color is exclusive to a certain retailer. Light green is exclusive to Books-A-Million, pink can be found only at Toys R Us, and turquoise only at Hot Topic. Cute isn’t exactly what H.P. Lovecraft had in mind when he wrote the incoherent horrors of the Cthulhu Mythos. Cthulhu is supposed to be a mess of octopus, dragon, and distorted human features. A creature that haunts mankind, even its sleep. According to the first appearance of Cthulhu in Lovecraft’s short story titled “The Call of Cthulhu”, the creature is the source of mankind’s general state of panic. This results in several human religions forming around the figure of Cthulhu, all believing the creature will eventually return. Though the metaphors are strong with the very concept of Cthulhu, our sense of curiosity has set such lessons aside in favor of exploring the depths and wonders of a world with Cthulhu in it. The first edition of DnD was one of the first creative avenues that took up the depiction of Cthulhu outside of Lovecraft’s universe, though the creature was not seen again until the 5th edition. Other depictions ended up in a huge variety of video games, all with vastly different interpretations of the original work. Some stay very close to the tale the original story told, others simply take one or two concepts and insert them into new horror or thriller stories. Regardless of how Cthulhu got to this point, the creature is now so popular that mere sight of its tentacle head could turn profits. Like this SuperCute edition, The Real Cthulhu is sure to bring delight to any Lovecraft enthusiast.